Outlined in a post to Slashleaks on Friday are supposed Geekbench benchmarks for ARM big.LITTLE chips with 10- and 12-core architectures. Information provided by an anonymous uploader claims the 10-core version is clocked at 3.4GHz, while supposed Geekbench screenshots show the 12-core chip, referenced as "[email protected]," running at 3.19GHz. The two application processors achieved respective single-core scores of 7335 and 6912, and multi-core scores of 20580 and 24240. What device the alleged ARM chips are powering is unknown, but the performance of each falls in line with desktop class hardware. Both processors beat single-core benchmarks set by Apple's 2017 27-inch Retina 5K iMac with 4.2GHz Intel Core i7-7700K, while the purported 12-core ARM chip's mutli-core score bests the 2018 15-inch MacBook Pro with 2.9GHz Intel Core i9-8950HK. It is unclear if the benchmarks shared today are legitimate, but it should be noted that the uploader joined SlashleaksAppleInsider was unable to verify the leak and does not vouch for its veracity. Apple has long been rumored to transition Mac away from Intel to a bespoke ARM architecture, but hard evidence of the development process has been elusive. Last October, analyst Ming-Chi Kuo in a note to investors predicted an ARM-based mac to arrive in 2020 or 2021. More recently, Intel officials in February told Axios they expect the tech giant to make the switch "as soon as next year." If Apple is making a stackable MacPro, I would imagine these chips would be stackable horsepower. I would be shocked if Apple were to introduce a MacPro with ARM so soon. It is all but inevitable that they will transition to ARM on their main Macs, but I suspect the laptops to be the first. Or maybe they might do a combo Intel ARM setup. Doubt it, but that'd be interesting. If Apple can create stakable hybrid SOC like Intel's lakefield than that will start a new chapter in MAC's future and year 2020/21 sounds right. This is actually more believable than that Galaxy Bud's review. Well, this is the only explanation I could think of why an iMac refresh is taking so long. 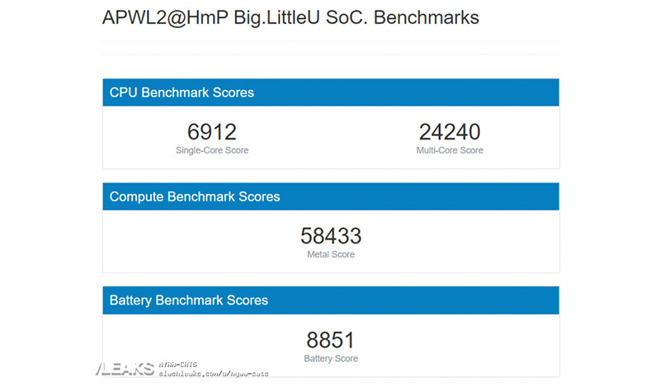 Although I can dream these benchmarks are for a new Apple TV. It sounds fishy, but I will still say "Welcome to the party, pal." It definitely won't be a Mac Pro that the Ax chips end up in: Pro apps are all geared towards maximum performance, and that means code tuned to the x64 architecture. However, in non-pro machines, especially in machines that are power-sensitive and thermally-sensitive, the Ax is perfectly suited. AppleTV already has the A8. What about an Apple TV is lacking in performance? I doubt AppleTV would ever get something like this. It may get a refresh to A11 or later, but that will be to make it easier on developers who use hand-rolled Metal code. (A11 architecture brought significant changes/advances to how Metal code is written). However, if this is true it’s going to set off a wave of unbridled rage not seen since Apple surprised everyone with a 64bit ARM processor. I firmly believe that Apple has had a MacOS/ARM machine in development for several years. Just like it did with the IBM->Intel, when the time is right and the performance is at least on par with Intel's offerings, they will introduce that machine. It only makes sense that it is the next logical step in Apple's eventual divorce from major chip suppliers like Qualcomm and Intel. Intel has shot itself in the foot way too many times and proven to be a real headache for Apple in having a constant introduction of newer x86 chips. My only hope is that there will still be some kind of compatibility with x86 instruction set. I know I'm part of a minority group, but I do have all my Macs (three of them) running Windows for certain development tools I use. Either way, the day Apple jettisons Intel's CPU, that will be the blast heard around the world, and a good time to short Intel. It's exciting to imagine a world where desktops and laptops follow iPhones on the hardware upgrade cycle. Even if the upgrades for non-phones were every 2 years, consistently, that would be better than some of the huge delays that occur now. Modular designs where components could receive updates for a certain time would be helpful in extending the usefulness of our hardware. I can think of one particular instance where Intel really put the screws to Apple: my MacBook was maxed out at 16GB ram and really needed 32 for opening up browsers with dozens of tabs. From what I understand, Intel's chip limited Apple on that front. They have already made dual processor machines in the past. There’s one in my closet gathering dust, so to me it’s not far fetched. Let’s make a quad or octo-cpu machine that screams! Or course, it might melt through the floor. If it’s “unsubstantiated, and highly suspect” then why is it even the subject of an article? Might as well publish purported sightings of Bigfoot reading Apple News on an iPad. I was like you then late last year I bought a Dell PC, i7, 32 GB RAM and Nvidia GTX 1080 (pretty cheap really) and stuck it on the LAN with all my Macs and gave up on VMWare. It has the advantage I can play GTA V in the evenings. Bring the Mac Pro with Apple CPU on! The multicore scores don’t make sense if the single core scores are ~7000 GB4 points. So fake imo. For the 10-core version to achieve something like this, it would be what, 2 big cores and 8 small cores? For the 12 core model, maybe 3 big cores and 9 small cores? This would perhaps be fitting for a laptop. For desktop, no reason to spare the cores. Just have 6, 8, 12, 16, etc, especially if perf/watt is better than Intel Skylake. Seems to me that if you’re going to transition to ARM, you need enough horsepower to handle x86 emulation for apps not recompiled to support ARM. I suppose this would be trivial to recompile existing apps using an updated version of Xcode, or to compile iOS apps to Mac soon which already using ARM instructions. I’m not a gamer, which I agree the Wintel platform is superior. For everything else, it’s Mac Hardware for me and I have been very happy with VMware. It’s the best windows machine I owned. Ok, I was going to post substantially the same thing. Those scores make no sense. The way Apple is going with the A+ series chips, there are equal numbers of performance and efficiency cores (not BIG/LITTLE, that’s an ARM naming convention for cores that work differently than Apple’s). So that could mean 5/5, or 6/6. If so, then the multi core scores should be higher. Since the more cores, the smaller percentage of contribution, ten of those cores should give about 6 times the performance. Twelve should give about 7 times. unless Apple is doing something odd. Actually, why should there even be as many efficiency cores as performance cores, since notebooks aren’t as limited in power and heat as iPads are. Besides, with increased clock speed, even efficiency cores should have enough oomph so that not a lot would be needed, and I would imagine that increased performance would come from improved IP as well.